Nice product, needed to get some shorter screws. Ordered the air cleaner not realising I would need the bracket and breather bolts. 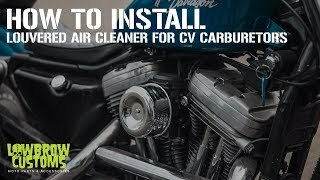 Would be nice if it was mentioned that those parts were needed to use air cleaner for new harley owners like me. Other than that, I love the air cleaner nice and small for my build, and fitment was great. Being a very low buck build on a Sporty I wanted something inexpensive. 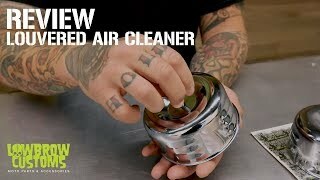 It is a nice little air cleaner for the price. I will probably change the filter element to foam instead of the paper one it came with. I like it, it's no wonder they are so popular and that you see them everywhere. https://www.lowbrowcustoms.com/catalogsearch/result/?order=relevance&dir=desc&cat=0&q=breather+bolts+ for EVO they will work with the bracket you have now. Hi will this fit a 2007 xl883c Efi ? will this fit a 91 FXRS?